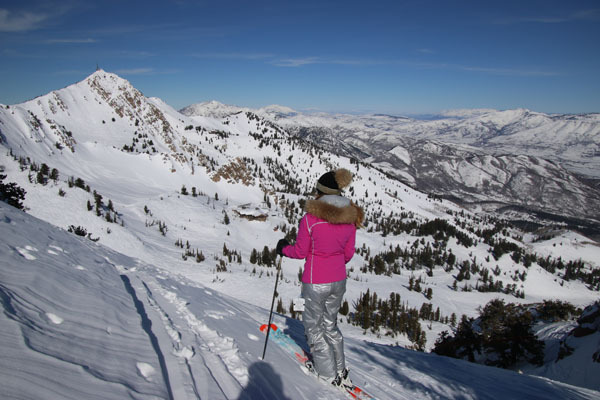 Snowbasin Resort is one of the best family ski areas in Utah. While most skiers and snowboarders go to Park City and Snowbird – Snowbasin is just 10 minutes further (45 minutes total) from Salt Lake City and far less busy, with skiing that is just as big and beautiful. Snowbasin also happens to have the best snowmaking in Utah. Snowbasin offers 3,000 acres with 6 unique peaks, everything from long undulating trails –cruisey blues on Strawberry Peak to steeps groomers on Allen Peak and the Olympic Downhill courses. In between the groomed trails are wide open bowls and well-spaced tree skiing. Snowbasin is amazing on powder day, with so much terrain and so few people. Snowbasin runs are super long and scenic, you can see four states and the Great Salt Lake from Strawberry and Allen Peaks. With three of Utah’s five longest ski lifts – the Strawberry and Needles Gondola, and the John Paul high speed quad, you can average 2,400’ vertical runs. 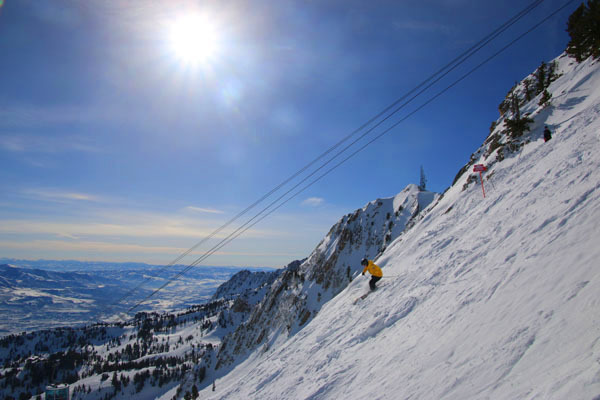 Snowbasin is a Top Utah Ski Resort. Snowbasin’s gorgeous on mountain lodges have opulent gold chandeliers and massive stone fireplaces inside. Its elegance with excellent food at reasonable cafeteria prices. Earl’s, Needles and John Paul Lodges are all posh like Sun Valley Idaho by no coincidence. Snowbasin shares the same parent company – the Holding family of Sinclair Oil and Little America Hotels purchased Snowbasin in 1984, installed two gondolas and a tram, built lavish timber lodges and grabbed the Olympic bids to host the Downhill, Super G, and combined for the 2002 Olympics. More recent news: Snowbasin & Sun Valley will be part of Vail Resorts’ Epic Pass in 2019-2020! Ski the steep exciting Downhill courses – 2,900 vertical down 78% grade steeps on the men’s Grizzly and the women’s Wildflower downhill, ideally from the tippy top of the upper tram Allen Peak 510’ extra vertical to experts only terrain and the official race start chalets. For beginners, Snowbasin has excellent kids ski and snowboard camps. Snowbasin’s Needles Gondola is a swift 2,300-foot vertical ride in an enclosed gondi, each one emblazoned with the name of a former Olympian, with views of craggy Mount Ogden, and the Needles, and great blue groomed runs. Strawberry Gondola is another eight passenger 2,400’ vert ride emblazoned with Winter Game countries in fun alphabetical order. Strawberry Bowl’s perfect intermediate pitch offer corduroy cruisers and fabulous open low angle glades ideal for family skiing. Snowbasin’s western flank mountain ironically named No Name Peak serves up steeps, glades and a few chutes. Après ski, go to the sumptuous Cinnabar in Earl’s Lodge for live entertainment, or enjoy the patio and fire pits while the kids play in the snow. Snowbasin is vast and offers classic Utah snow and terrain (tons of stashes on a powder day) with upscale Sun Valley-like lodges and the most sophisticated snowmaking in Utah. Snowbasin’s on mountain lodging is in planning phase, no ski in ski out hotels or condos yet. For lodging head down Snowbasin’s highway-like mountain road to Huntsville, just 8 miles away, and stay at Lakeside Resort Properties. This townhouse-style condo resort is “lakeside” on the shores of Pineview Reservoir. Our condo had its own car port, fireplace, its own outdoor hot tub on the deck, two bedrooms beautifully decorated in rocky mountain regal leather and antlers, with a spectacular view of Snowbasin’s slopes. Other units have a water view. Its private and spacious – a home away from home. From Lakeside, you’re a short drive to Eden, a market and liquor store, and a few fun Mexican joints and restaurants. Ogden is 17 miles, renowned as home of the east-west railroad’s Golden Spike, and historic 25th Street with eateries, shops and an old train station. A ski trip to Snowbasin should include a day or two skiing nearby Powder Mountain.